Master Box Dimension : 20" X 19" X 19"
The Little Helper Pretend play toy is perfect for your child, so they can help you with all of your house chores. The playset comes with the following: Swiffer Mop, Dust Pan, Brush, Bucket, and even a very cute caution. These are the tools that kids will use to clean up all the dirty mess that they left behind. In addition, the playset comes with accessories like the detergent bottle, Squeegee, and Soap. It's clean up time! Comes with a accessories such as, detergent bottles, squeegee, soup, dish towel. 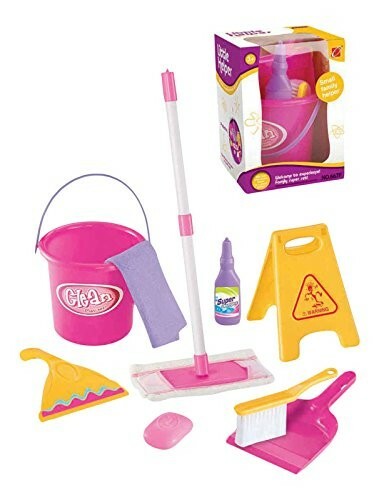 Clean up time has never been this much fun with this pretend playset!